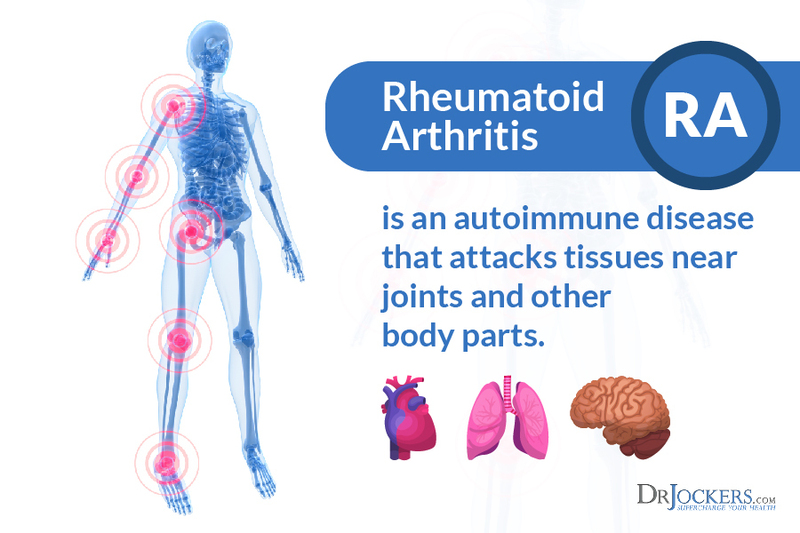 Rheumatoid arthritis (RA) is an autoimmune disease that primarily attacks the synovial tissues around the joints. Autoimmune diseases cause the body’s immune system to mistake its own tissues for foreign invaders, such as bacteria or viruses. The confused immune system develops antibodies to seek out and destroy the “invaders” in the synovium. RA is a systemic disease, in that has the ability to affect the whole body. It can attack many different organs, such as the heart, the lungs, or other tissues like muscles, cartilage and ligaments. RA causes chronic swelling and pain that is sometimes severe, and it can cause permanent disability. RA is a common chronic disease that affects about 1% of the world population. RA occurs at twice the rate in women compared with men, with a prevalence of 1.06% in women (as a percentage of the total population) compared with 0.61% in men (1). The incidence (new cases per year) of RA increases with increasing age in most populations until about the eighth decade of life, when it declines (2). The prevalence of RA varies widely from population to population, with the lowest rates in Asian countries and higher rates among certain Native American populations (3). The early onset of RA typically effects the small joints such as the fingers and toes. Many just feel as though these areas are mildly warm, stiff or swollen. These symptoms are often intermittent, only flaring up for a few days at a time and most people ignore the issue for a while. Over time, RA symptoms can get worse and cause deformity in the fingers and toes. The disease can also progress to larger joints such as the shoulders, knees and hips. RA may cause significant damage to the joints within 2 years of onset. RA also has been shown to significantly increase the risk of heart attack and stroke because it can damage the protective sheath around the heart called the pericardium (4). The development of RA is based around both genetic and environmental factors that effect the major histocompatability (MHC) genes and the bodies innate immunity. Environmental factors that increase the activation of the innate immune system can disrupt immune balance and cause chronic inflammatory activity in the body (5). The process of developing RA can take many years. One key factor is the induction of the peptidyl arginine deiminase (PAD) enzymes, which convert arginine to citrulline. Increased citrullination is not specific to RA and occurs regularly with any environmental stress, including in lung alveolar macrophages in cigarette smokers (6). What is unique to RA is the propensity for immune reactivity to the neoepitopes created by protein citrullination with the production of anti-citrullinated protein antibodies (ACPAs) (7, 8). In “pre-RA,” ACPAs and autoantibodies like rheumatoid factors (RFs) can appear more than 10 years before clinical arthritis. Additionally, inflammatory cytokines such as TNF-alpha, IL-6 and IL-1 are active in individuals with pre-RA and this extends into RA where these cytokines only grow in number and accelerate the inflammatory storm in the joint and organs (9). Early stage RA (stage I) is characterized by synovitis, or an inflammation of the synovial membrane, causing swelling of involved joints and pain upon motion. During this stage, there is a high cell count in synovial fluid as immune cells migrate to the site of inflammation. However, there is generally no x-ray evidence of joint destruction, with the exception of swelling of soft tissues and possibly evidence of some bone erosion. In moderate RA, stage II, there is a spread of inflammation in synovial tissue, affecting joint cavity space across joint cartilage. This inflammation will gradually result in a destruction of cartilage, accompanied by a narrowing of the joint. Severe RA, stage III, is marked by formation of pannus (vascular scar tissue that extends over the surface of an organ or joint) in the synovium. Loss of joint cartilage exposes bone beneath the cartilage. These changes will become evident on x-ray, along with erosions around the margins of the joint. Joint deformities may also become evident. Stage IV is called terminal or end stage RA. The inflammatory process has subsided and formation of fibrous tissue and/or fusing of bone results in ceased joint function. This stage may be associated with formation of subcutaneous nodules. Chronic inflammatory disorders are characterized by a hyper responsive immune system. There are several key factors that must be addressed to regulate and better coordinate the immune system. 1. Poor Blood Sugar Stability: Blood sugar imbalances cause immune dysfunction and malcoordination. Stable blood sugar is critical for a healthy immune response. 2. Low Vitamin D Levels: Individuals with low vitamin D3 levels (below 40 ng/ml) are at significant risk for developing chronic inflammation and auto-immunity (10). 3. Gut Dysbiosis: Poor microbial balance in the gut microbiome leads to leaky gut syndrome and chronic inflammation (11). The gut must be addressed in order to get well. 4. Mitochondrial Dysfunction: The mitochondria are the energy producing organelles in each cell of the body. They are extremely key in the bodies ability to handle oxidative stress. Dysfunction in the mitochondria leads to increased free radical and oxidative stress which creates immune alterations. Many researchers believe that other autoimmune diseases such as multiple sclerosis are primarily a mitochondrial disease (12). 5. Low Glutathione Levels: Glutathione is the major anti-oxidant within every cell of the body. It is critical for white blood cell (WBC) function as the WBC’s encounter tremendous amounts of free radical and oxidative stress every second of the day. 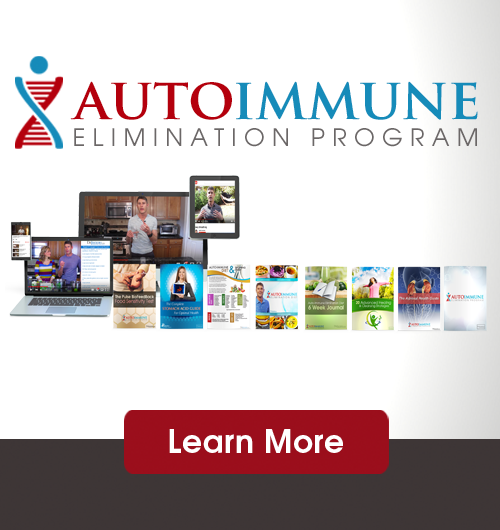 Low glutathione leads to chronic inflammation and often to auto-immunity (13). 6. Poor Omega 6:3 ratio: The average person has significantly more omega 6 fats than omega 3 fats. The increased omega 6 stimulate the release of pro-inflammatory mediating prostaglandin molecules. This is a key factor in the development of chronic inflammation and auto-immunity (14). 7. Upper Cervical Subluxation: The bottom of the skull (occiput) and the first bone (atlas) play a significant role in the coordination patterns of the brain and immune system. Dysfunction at this joint torques and compresses the top of the spinal cord and increases inflammatory activity in the body (15). 8. Environmental Toxins: Exposure to high levels of infectious microbes, environmental chemicals such as plasticizers, pesticides, herbicides, personal care products, heavy metals and biotoxins such as mold wear down the bodies glutathione levels, alter the gut microflora and increase inflammatory activity in the body (16, 17, 18). 9. High Stress and Poor Breathing Habits: High mental and emotional stress increases stress hormone production which induces inflammatory activity within the body. Short and shallow breathing habits can simulate chronic mental and emotional stressors on the physiological level (19). 10. Lack of Sleep: Poor sleep promotes immune dysfunction and increased inflammation. Good sleeping habits and optimal melatonin secretion reduce inflammation and promote improved tissue healing (20). 11. Methylation: Methylation is a key process that protects DNA, turns on and off genetic traits and helps to detoxify environmental chemicals. Many individuals have certain genetic polymorphisms that limit their ability to appropriately methylate. Methylation plays a very important role in T cell function and poor methylation status is associated with the development of auto-immunity (21). I will touch on a few of these key areas and how they relate to Rheumatoid arthritis in this article. Gluten is the common protein molecule found in wheat, barley, rye, kamut and spelt. Gluten is a sticky storage protein that binds to the small intestinal wall where it often causes digestive and immune system disorders. 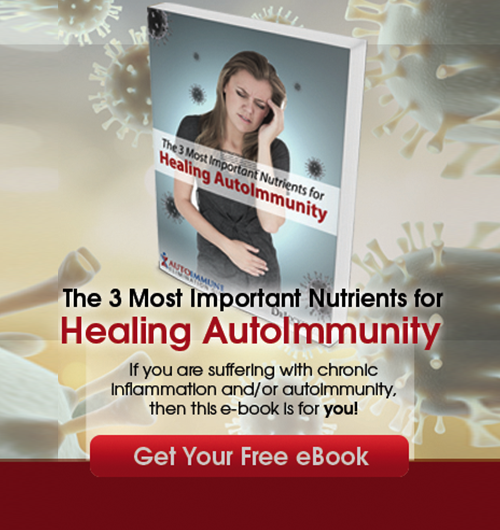 Gluten sensitivity is an epidemic that is a major factor in the development of auto-immunity. Research has shown a high prevalence of gluten sensitivity in individuals with auto-immune connective tissue disorder such as RA, lupus, scleroderma and Sjograns disease (23). Studies have shown that a gluten-free diet has improved anti-body counts and symptoms in many individuals with rheumatoid arthritis (24). Vitamin D is critical in the development and maturation of the immune system. It helps to enhance self-tolerance and reduce the risk of auto-immunity and chronic inflammation. Low vitamin D levels are a common finding in auto-immune diseases (25). Reduced vitamin D intake has been linked to increased susceptibility to the development of rheumatoid arthritis (RA) and vitamin D deficiency has been found to be associated with increased disease activity in patients with RA (26, 27). The gut microbiome is made up of over 1000 different species of microbes and it plays a huge role in nutrient absorption, detoxification and the development and maturation of the immune system. Certain bacteria of the gram negative classification are known to release a potent inflammatory mediator called lipopolysaccharide (LPS). Researchers have found that individuals with RA have high levels of the gram-negative bacterium Prevotella copri, which is correlated with an increase in LPS and inflammation. Additionally, these individuals had an overall loss of beneficial anti-inflammatory microbes. Additionally, the P Copri drove up the inflammatory cytokine Th-17, which promoted inflammation through another mechanism (28, 29). Individuals with RA have a much higher tendency to have small intestinal bacterial overgrowth (SIBO) than the normal population (30). We should normally have the majority of our bacteria in the large intestine and not in the small intestine. SIBO develops when the normal homeostatic mechanisms that control intestinal bacterial populations are disrupted. The two processes that most commonly predispose to bacterial overgrowth are diminished stomach acid secretion and lack of small intestine motility (31). SIBO can lead to key nutritional deficiencies and chronic inflammation. When the microbiome is dysregulated it often leads to a damaged gut lining and intestinal permeability. This is found in the pathogenesis of rheumatoid arthritis and other auto-immune diseases (32, 33). This “leaky gut” causes undigested food particles to pass into the bloodstream where they are tagged by the immune system and attacked with massive inflammatory processes that have the ability to affect nearly every system in the body. This creates a food allergy or sensitivity that the body reacts to whenever it is exposed. The most common food based culprits include all processed foods, artificial sweeteners/preservatives and gluten containing products. Soy, peanuts, pasteurized dairy, corn and eggs are often not tolerated well. The nightshade family of eggplant, potatoes and tomatoes are often challenging on the system as well. The most common medications given to individuals with RA, non-steroidal anti-inflammatory drugs, have been shown to increase intestinal permeability (34). So these medications may reduce inflammation and pain by suppressing key inflammatory prostaglandins, but they also promote further development of the disorder. Mitochondria are one of the main cellular sources of reactive oxygen species (ROS) and reactive nitrogen species (RNS) and play a pivotal role in many autoimmune and chronic inflammatory conditions. Mitochondrial dysfunction leading to excessive production of ROS and RNS plays a significant role in the pathogenesis of RA (35, 36). In rheumatoid arthritis, the cells are under so much stress that there main protective shield, glutathione (GSH) gets worn down and oxidative stress damages the mitochondria and the DNA leading to cell death. Poor blood sugar control and high environmental toxin exposure are known to deplete glutathione levels and impair mitochondrial function (37, 38). It is advisable for anyone with chronic inflammation to include organic vegetable juices, fermented foods and herbal teas in their diet. Homemade sauerkraut, apple cider vinegar, coconut water kefir, and kimchi are great. Begin with small doses of all of these and add more if you tolerate them well. Organ meats such as grass-fed liver, heart, etc. are rich in mitochondrial support nutrients. Powerful herbs such as turmeric, ginger, garlic, onion, rosemary, thyme, cinnamon, & oregano among others should be used as much as possible to improve immune coordination. Consuming lots of sulfur based onions, garlic, cruciferous veggies on a daily basis and getting high quality seaweed in the form of kelp can be extremely helpful. Using purified fish oils to boost up omega 3 levels is also very important. The best way to rebuild the intestinal wall is to incorporate a daily lifestyle of intermittent fasting. This should be a 16-20 hour liquid diet each day in which only cleansing beverages such as fermented drinks and lemon water are consumed. Consume high quality shakes with berries, coconut or hemp milk and a hypoallergenic protein powder. No more than one solid food meal a day should be consumed for at least a 3 month period of time to ensure proper healing. One could also incorporate a six week liquid diet to take the stress of the digestive tract and speed up the process of healing the gut lining. Vegetable juices can and should be consumed throughout the fasting period. Some of the best vegetable juices include wheatgrass & cabbage juice among others. Wheatgrass is known for its incredible chlorophyll content and ability to purify the bloodstream. Cabbage is loaded with the amino acid L-glutamine which is the primary amino acid in the gut wall. Digestive enzymes and fermented foods should be used before or during the solid food meal to enhance digestion. Heavy duty probiotic supplementation should be used in the evening after the solid food meal to reduce inflammation that would be caused by the solid food of the meal. Chronic inflammatory disease processes are influenced by the nervous system which controls the coordination of the immune system. Nerve stimulation is essential for the growth, function and control of inflammatory cells. Researchers have found that abnormal neurological control results in the development of auto-immune based inflammatory conditions such as RA (39, 40). Subluxation is the term for misalignments of the spine that cause compression and irritation of nerve pathways affecting organ systems of the body. Subluxations are an example of physical nerve stress that affects neuronal control. According to researchers, such stressful conditions lead to altered measures of immune function & increased susceptibility to a variety of diseases (41). The upper cervical spine is the most important region for immune coordination. Various wellness chiropractors specialize in stabilizing the upper cervical spine which allows the nervous system to control and coordinate the body with greater efficiency. Many individuals with auto-immune diseases such as rheumatoid arthritis have ligament laxity at the upper cervical spine. It is essential to see a well-trained wellness based chiropractor that specializes in upper cervical care and corrective care and has much experience working with individuals with advanced conditions such as RA (42). These chiropractors will use a regiment of specific adjustments and corrective exercises to minimize subluxation, restore proper neurological tone and maximize the bodies healing potential. Here are the best action steps to get started with on your journey to prevent and/or beat Rheumatoid Arthritis. You should always consult with your physician before stopping or changing medications or taking on new health strategies. Additionally, you should be working with a functional health practitioner to help guide you through these strategies. This is not an exhaustive list and there are other natural therapeutic strategies that I and functional health practitioners will utilize to help individuals with Rheumatoid Arthritis. 11) Improve Your Mitochondria: The mitochondria are the energy powerhouses of every cell. When someone has RA it is a clinical sign that they have dysfunctional activity going on in the mitochondria. Support your mitochondria with clinical doses of CoQ10, L-carnitine, N-acetyl cysteine and Lipoic acid. The supplement I use with my autoimmune clients is Brain Supercharge which has the clinically effective dosages of each of these key nutrients and more. 15) Optimize Your Vitamin D: Be sure to increase your vitamin D through good amounts of regular sun exposure and/or taking a high quality vitamin D3/K2 supplement. 19) Low Intensity Movement: A sedentary lifestyle reduces synovial fluid flow in the joints and can lead to increased oxidative stress throughout the body. Throughout the day, get a lot of low-intensity movement such as walking, light cycling, playing, etc. Regular movement will help reduce inflammation in the body and help stabilize the joints boost the development of new neurons in the brain. 6. Baka Z, Buzás E, Nagy G. Rheumatoid arthritis and smoking: putting the pieces together. Arthritis Research & Therapy. 2009;11(4):238. 12. Mao P, Reddy PH. Is multiple sclerosis a mitochondrial disease? Biochimica et biophysica acta. 2010;1802(1):66-79. 18. Ercolini AM, Miller SD. The role of infections in autoimmune disease. Clinical and Experimental Immunology. 2009;155(1):1-15. 25. Aranow C. Vitamin D and the Immune System. Journal of investigative medicine : the official publication of the American Federation for Clinical Research. 2011;59(6):881-886. 26. Kostoglou-Athanassiou I, Athanassiou P, Lyraki A, Raftakis I, Antoniadis C. Vitamin D and rheumatoid arthritis. Therapeutic Advances in Endocrinology and Metabolism. 2012;3(6):181-187. 29. Scher JU, Abramson SB. The microbiome and rheumatoid arthritis. Nature Reviews Rheumatology. 2011;7(10):569-578. 30. Henriksson AE, Blomquist L, Nord CE, Midtvedt T, Uribe A. Small intestinal bacterial overgrowth in patients with rheumatoid arthritis. Annals of the Rheumatic Diseases. 1993;52(7):503-510. 31. Dukowicz AC, Lacy BE, Levine GM. Small Intestinal Bacterial Overgrowth: A Comprehensive Review. Gastroenterology & Hepatology. 2007;3(2):112-122. 32. Arrieta MC, Bistritz L, Meddings JB. Alterations in intestinal permeability. Gut. 2006;55(10):1512-1520. 34. Sigthorsson G, Tibble J, Hayllar J, et al. Intestinal permeability and inflammation in patients on NSAIDs. Gut. 1998;43(4):506-511. Glad you got a lot out of the article Beth! The article is very informative. I’ve had RA for 19 years, Celiac Disease for over 3 and have been on a gluten free diet for 2 or so years, I’m also IgA difient so getting a true test result on the Celiac was very complicated. I have problems with my Vitamin D3 for 12 years but now have it at normal levels, I still don’t sleep well, I have fibromyalgia, 2 broke hips with one replaced, also have GERD, asthma and COPD. Much of what i read in your article I’ve rad in other books or articles. It’s so overwhelming. Where to start when there are so many issues. I feel sick most of the time from one or more issues. Very depressing sometimes. Thank you for what you do. Information is key to helping people like me. So sorry to hear about all of this Kathy! So glad you are taking many great action steps like the gluten free diet and boosting D3. Be sure to follow the other strategies in the article to get better results and overcome these health challenges! It is made by corn and can be immune reactive, so I don’t recommend it. And what red beet? Is for RA OK? Hi. I see that RA is not the only disfunction if this relates autoimmune state of health. There is the whole complex of metabolic og digestive dysfunctions. I have some similar symptoms, but not so much on RA. I am just thinking all the time on what is a real cause of this state. Taking into account literature which I have read, I believe that the cause is in lymphatic system, intestinal inflammation lymphatic nodder og wrong circulation of lymphe. What do you think about that? I have a chronic RA pain, it is really painful. Please let me know more about the disease. Your article is so informative and has cleared some issues I falsely believed in the past. Hey Ronaldo, everything in the article above is geared towards helping you solve your pains. If you would like to work with a functional nutrition practitioner to build a customized health plan, reach out to michael@drjockers.com to get started! I have gluten intolerance but because of stress at work had been cheating with some gluten tainted foods. In January, I started getting joint pain in my right thumb now swollen and painful. Now the left thumb is starting to get joint pain as well as the ball of my left foot. A month ago, my neck began to ache making it difficult to turn my head side to side. Recently, I had a horrible flew virus with vomiting and diarrhea which completely depleted me. The next day or so, as I recovered, all of my pain and swelling symptoms disappeared, but once I began eating regular foods, it all came back. I have been very careful to keep gluten out of my diet since then but the pain and swelling has returned. I also have had hypothyroidism and have been on medication for 25 years. I plan to get blood work done in the next few weeks to confirm what this swelling and pain could possibly be. My symptoms appear to be caused by RA. Why would it all disappear after my flu? Is it possible all caused by a leaky gut? I am not sure why it might go away after a flu. Were you fasting during that time? I will say it is very common for people that have RA to also have a lot of gut issues. It is an important stressor to address to help the body heal! I want to study causes of ra .i want to help my wife to fight her deses. I need a natural food treatment helping her to control ra semptoms. I need some body care of us. So sorry to hear that! Praying for you! I am on methotrexate and sulfasalazine tablets for my RA, both of which are to be taken with or after food – if I were to attempt the 6 week liquid diet will that negatively affect how my medication is absorbed? Basically can I take my medication without food? You will need to discuss this with your prescribing physician! After my Rheumatoid Arthritis diagnosis in 2009. I was put on Naprosyn and after some time i didn’t feel any different, so i started on a Natural RA Formula treatment protocol from RICH HERBS FOUNDATION (ww w. richherbsfoundation. com), the treatment effectively treated my Rheumatoid Arthritis condition. The swellings, stiffness, fatigue and joint/muscle/body pains has subsided, I feel better overall than i have felt in years. Six months after the treatment, I made an appointment with a rheumatologist in Houston, after examining me, she looked at me and told me I did not have Rheumatoid Arthritis because all the usual Rheumatoid Arthritis symptoms had stopped. Its almost like a miracle! That is wonderful to hear Monica! Thank you for sharing.